Sometimes, where it is allowed, larger fish are brought back to camp and laid out on a table for all to see before being prepared in such a way that they become unrecognizeable. Pieces of skin adhering to the hard crust of burned corn meal stuck to a cast iron pan are sometimes the only clues remaining as to why the pan was in the trash. 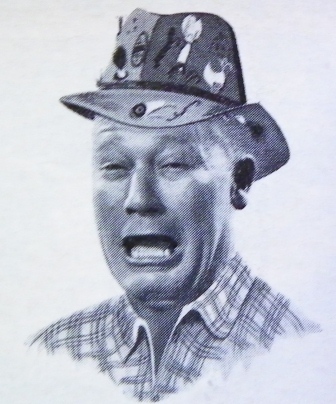 Not only was it a challenge to cook in cast iron on an ancient electric range, someone had to gut that fish and decide “head on” or “head off” before flinging the offal into the bushes out the back door and what’s with all the racoons? Such are the problems some anglers face. Unappreciated for the skill and cunning you’ve shown in pursuit of your quarry, it might be nice to have an audience for a change and hear those drums as you land a fish. Even better would be to have someone else see to the preparation and serving of your catch, allowing you to concentrate on more important matters like cocktails. Let them do the dishes, too. Regular readers of these irregular posts are aware that our editorial staff is I am constantly on the lookout for ways to ease such troubles. When there was a need for quality Tenkara gear I was here with Vermont Hand Crafted Tenkara Rods. When working guides needed a way to manage and control the groups in their care I changed everything by introducing some New Gear, for Fishing Guides Only! More recently, realizing that some anglers expect less from nature™, I introduced An Idea That Will Revolutionize Fly Fishing so some of you may be thinking I’ve struck gold again. I have not. Someone beat me to it. Opened last fall, Zauo (152 W. 24th St. in New York City) offers the opportunity to catch your own dinner from one of several tanks. You’ll need a license, though, which can be obtained by signing a liability waiver. Rainbow trout, striped bass, and “salmon trout” share a tank on the main level, with flounders and other ocean fish upstairs. The rails around the tanks provide plenty of room to set your glass while you fish, using a short rod they provide. 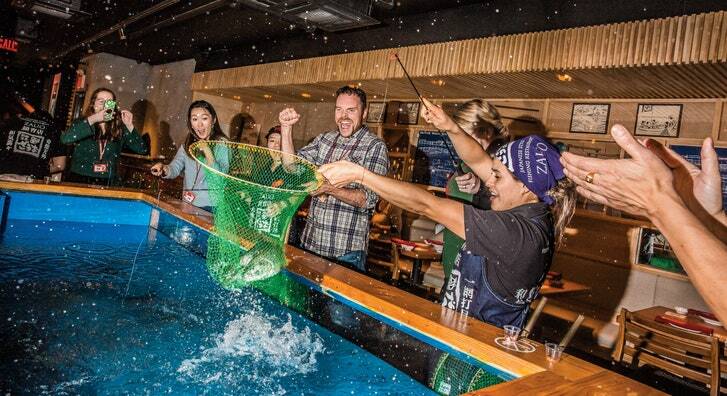 The staff will cheer for you and beat mighty drums in celebration while an assistant nets your catch and whisks it to the kitchen after a few quick photos. 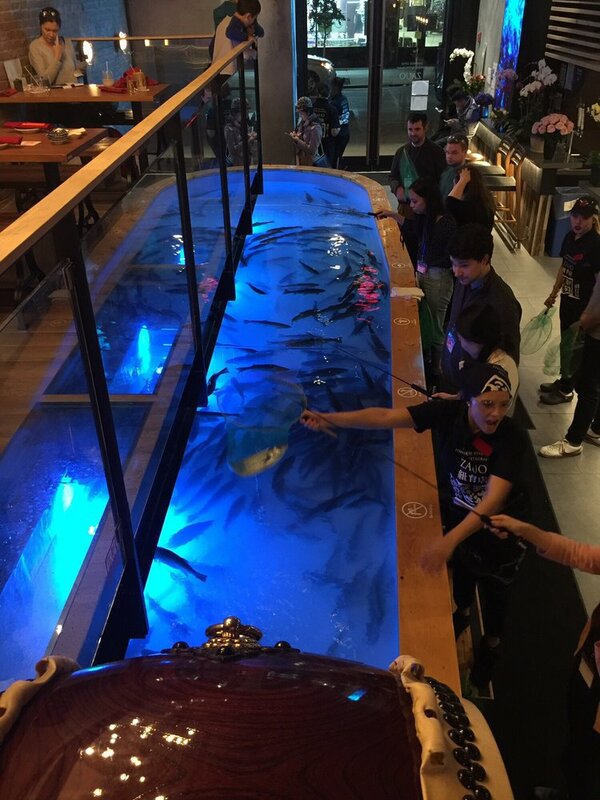 Your fish will then be prepared according to your choice of several options while you wait comfortably at your table. Lucky diners might even encounter a group of protesters, providing additional entertainment as they work to be heard above the drums and all the cheering. Fishing indoors with cocktails, surrounded by an admiring throng while someone else cooks your dinner. What could be better than that? I have always thought this was the sort of thing that would appeal to a certain segment of the angling community and I find nothing that says you can’t bring your own rod. Mid-winter fishing trip, anyone? So, someone beat me to the punch and is providing indoor fishing with cocktails before I got around to it myself, but that doesn’t mean there is not a way to get in on the action. The fish at Zauo are not sold by the pound, they are sold individually, at “market” prices according to species. Rainbow trout are the least expensive, running between $30 and $40 each, with “salmon trout” going for around $100. The price includes preparation and service, of course, but the price goes up for patrons who do not wish to catch their own fish and that’s where I see opportunity. Guides who are sitting around waiting for spring might want to get in on this, too, so listen up. Zauo already hires “assistants” so why not help them up their game by adding a little professionalism and color to the crew? Share your knowledge and spread the joy of fishing to those who are willing to give it a go while keeping your angling skills sharp by catching fish for those who are not. Let’s say Zauo charges an extra $7 to those who don’t catch their own fish. I figure one could do pretty well by charging Zauo half that to do the catching, especially if the moon lines up and the barometer is right. And just think of the tips when you unroll a huge indoor double haul from the balcony to take that big rainbow by the third bar stool from the left! Don’t think this opportunity is available only to fly fishers. Zauo allows fishing with bait and snagging with treble hooks, too (no word on Tenkara). I’m not sure how it is done but somehow you can also catch your own abalone, among other things, although I think the lobsters would be more challenging without the rubber bands. Whether you’re an angler needing a quick fishing getaway or a professional guide looking for a little winter money, why not string up a rod at Zauo in New York? I’m sure they’ll be glad you did.